The Art Cart, our newest amenity, nestles creative chaos on the north side of the Library Terrace. From 11am to 7pm daily, let your imagination run wild with professional-grade drawing and craft materials. If you're stumped on what to create, or want to learn a new technique, register for our free lessons with skilled instructors, called Drawing Lessons and Structured Play. 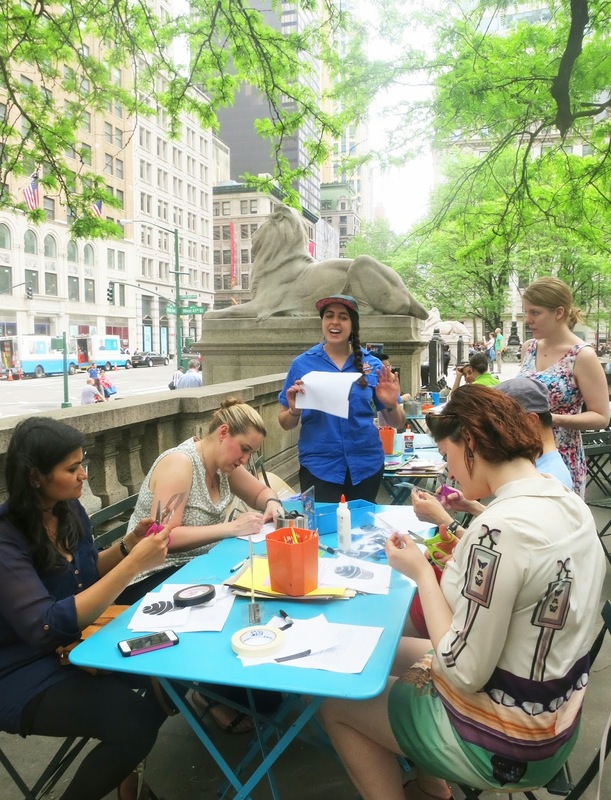 During Structured Play classes, Cassie and Meredith from Artist & Craftsman Supply lead one-hour specialty classes. In April, Structured Play participants worked on collages with paper cutouts, tissue paper and leaf applique while learning about different types of glue/adhesive. In May, participants worked with stencils and repeated patterns, creating their own stencils out of paper, layering patterns on one unified drawing board, and seeing how larger stencils and airbrushing can be used to make custom T-shirts. Structured Play is free and all levels are welcome (the age listed is a recommendation, but we can accommodate any age); participants are encouraged to pre-register. 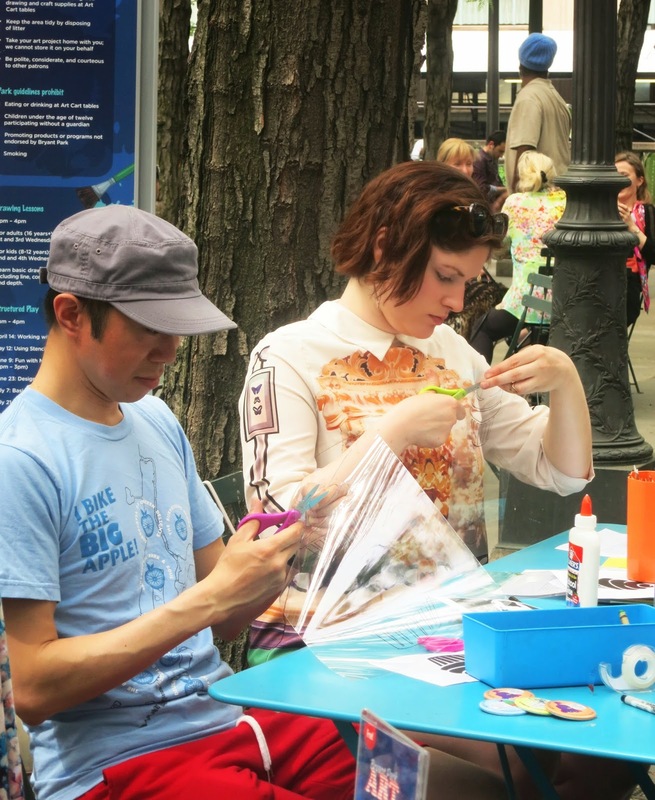 Structured play participants work with paper and glue to create one-of-a-kind works. 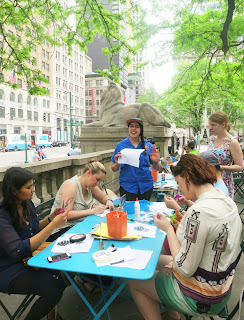 During Drawing Lessons, artist Samantha teaches drawing techniques such as line, shade, and crosshatch, and then applies those skills to an element in Bryant Park. 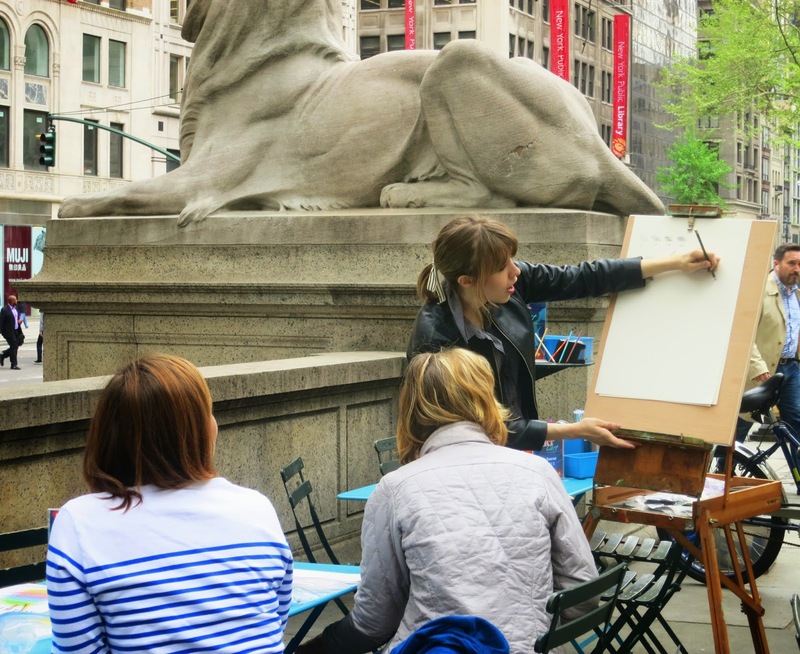 In past weeks, participants have drawn the lions Patience and Fortitude, the New York Public Library façade, library fountains, Fifth Avenue Terrace balustrade, and people eating lunch in the park. To keep the inspiration fresh, the May 20th and 27th sessions will have still-life setups. Drawing Lessons are Wednesdays; the first and third of each month are for adults, while the second and fourth are recommended for children age 8-12. Samantha teaches line, shading, and cross hatch. And as always, you get to take your project home with you!! Artist & Craftsman Supply have generously donated materials for use throughout the Art Cart season.